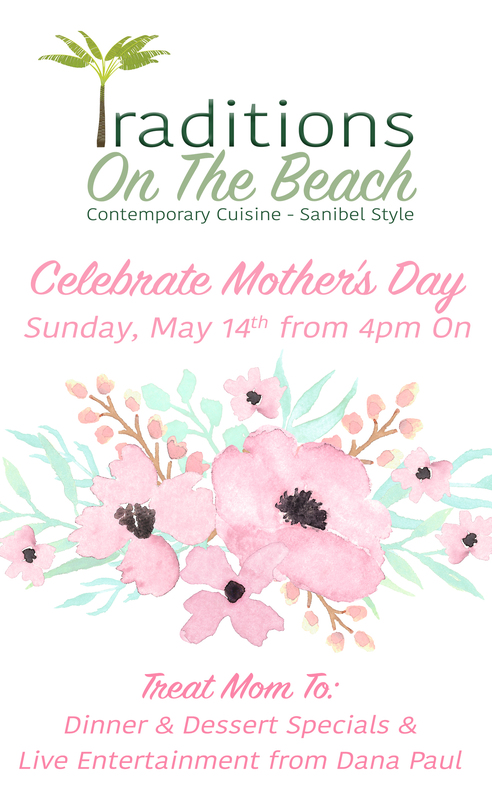 This Mother’s Day Traditions on the Beach, Sanibel’s first restaurant, bar and lounge, welcomes all the important women in your life to a wonderful evening of fine food and live entertainment with the best beachfront view on the Island. Why not spend special time with Mom enjoying the best Sanibel has to offer – shelling, biking or alternatively just relaxing on the beach? And for a perfect ending to your perfect day, enjoy a wonderful dinner overlooking the sunset into the Gulf of Mexico? The is now accepting reservations for Mother’s Day, Sunday, May 14 from 4 p.m.
To celebrate, all ladies will be greeted with a fresh rose to set the mood for an evening full of love. Upon the sun setting, Dusk Duo will entertain with a special performance with live entertainment. In addition to their regular full menu, Chef Aziz is preparing exclusive Mother’s Day entrée and dessert specials including pasta, veal, and seafood dishes. Themed additions such as the ‘Heart shaped poached Maine lobster ravioli,’ are sure to make the evening a delight for all! Reservations are suggested. Click here for our Event Calendar!